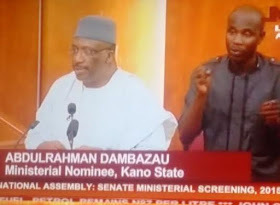 Miniterialscreening: Senate screens Gen. Abdurrahman Dambazau. The senate has screened Gen. Abdurrahman Dambazau (Rtd), a former Chief of Army staff. During his presentation, Dambazzau said Nigeria has a defense policy which needs to be reviewed regularly. He also called for the review of allowances of soldiers, both for those serving in the North East and those who serve in foreign missions in places such as Sierra Leone. He said the Nigerian military has to stick with National security and not regime security. He said that the current N1,000 allowance of soldiers is too low and must be reviewed upwards. On conflict of farmers and herdsmen in the North and South, he said this has an adverse effects on agriculture. He said ecological issues such as desertification and erosion have to first be tackled to eradicate this problem. He said this crisis takes a religious turn and called for the root cause of these issues to be addressed. He called for more medical support for soldiers. On making the military a viable employment opportunity for youths, he called on government to make the terms and conditions of engaging a soldier very attractive. He said Boko Haram is a conflict and is a pseudo-religious crisis.